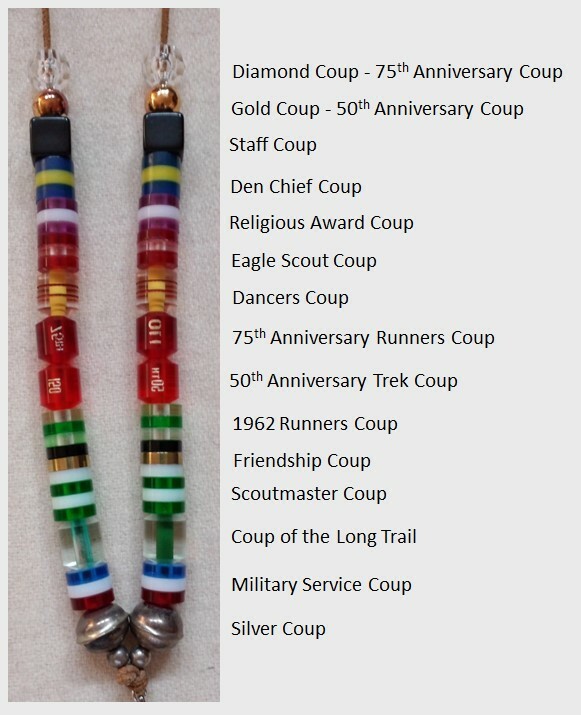 A Tribesman’s lanyard consists of recognitions and achievements presented as “coups.” It creates a personal identity for a Tribesman, showing what he or she has accomplished with his or her life and Scouting career. In short, it tells a personal story. Coveted Coup: Awarded at ceremony for each year of service to Scouting. Established in 1932 and made retroactive to 1929, the coup may be first earned one year after elevation to Warrior. Spherical bead of color, or clear, except gold or silver, by choice of individual. Anniversary Coup: Awarded for participation in special anniversary celebrations and, if earned, is worn in place of any additional coveted coup for that year. 1. Gold Coup: Awarded to Tribesmen who attended the 50th Anniversary Tribal Feast in 1979. The Gold Coups is worn as the first coveted coup on a lanyard. Spherical gold coup. 2. Diamond Coup: Awarded to Tribesmen who returned to the Reservation during the 75th Anniversary season of 2004. It should be worn above the gold coup and below all other coveted coups. Any Tribesman who came to camp during 2004 may wear the Diamond Coup whenever they are eligible to wear Coveted Coups. It should be worn instead of any additional coveted coup for the year. Spherical, faceted, clear coup. Staff Coup: Awarded to members of the Camp Staff who served at least three full sessions at Bartle or Rotary Camp. Established in 1939, it is awarded only once and only one set is worn on a lanyard. It is the only coup that may be worn with a brave pouch. Square coup of any color. Den Chief Coup: Awarded to Tribesmen who served as a Den Chief for at least one year. This coup was first awarded in 2014 and is awarded to those Tribesmen who served as a Den Chief since 2013. Awarded only once and only one set is worn on a lanyard. Cylindrical coup in three bands: blue, yellow, and blue. Religious Award Coup: Awarded to those who earned a Religious Award as a Boy Scout, Varsity Scout, Explorer, Venturer, or adult. This coup was first awarded in 2000. Awarded only once and only one set is worn on a lanyard. Cylindrical coup in three bands: purple, white, and purple. Eagle Scout Coup: First awarded to all Eagle Scouts in 1995. Awarded only once to those who are Eagle Scouts. Cylindrical coup in three bands: red, clear, and red. Dancer Coup: First awarded during the 10th anniversary year of the Mic-O-Say Dancers in 1989. The coup is awarded once to dancers who have served at least two years as a dancer and has met Tribal attire and attendance requirements. Clear tapered cylindrical coup with two burgundy bands and a yellow center. Event Coups: Event coups are received for participation in specially authorized events by the Council of Chieftains. In order to be considered, the event must be open to all Tribesmen and hold significant relevance to the Tribe. If more than one of these coups are earned, the Tribesman should place them at this point on their lanyard in the following order, from the bottom up. 1.Friendship Coup: Awarded only once and only to those Tribesmen who, in 1955, participated in the first Tribal ceremonies at Camp Ernst (now closed). Cylindrical form with three bands: black (top), gold, and white. 2. 1962 Runner Coup: Awarded to those who participated in the ceremony for the opening of Camp Frontier (now Camp Piercing Arrow) in 1962. The group gathered at the Liberty Memorial in Kansas City and lit a torch which was carried by runners to the town of Osceola. From Osceola, they canoed down the Osage River to a place below the Point. The torch was used to light fires in SheSheBe, Lone Bear, the Memorial Chapel, Wigwam (now Lone Star), Sawmill, and, finally, Frontier. A torch atop a stone column in Frontier was lit, there to burn for several years to mark the occasion. Cylindrical coup in three bands: clear, green, and clear. 3. 50th Anniversary Trek Coup: Awarded to approximately 35 Tribesmen who ran from Noel, Missouri, to the H. Roe Bartle Scout Reservation in commemoration of “50 years of Friendship and Warmth.” Tapered cylindrical coup in red with “150” miles on one side and “50” years on the other. 4. 75th Anniversary Runner Coup: Awarded to approximately 500 Tribesmen who ran from the H. Roe Bartle Scout Reservation to Kansas City’s Municipal Auditorium in April 2004, symbolically carrying the spirit of Mic-O-Say to open our 75th Anniversary celebrations, and who gave service in a special work project to benefit Kansas City. Tapered, clear red, cylindrical coup with “75” years stamped on one side and “110” stamped on the other. Scoutmaster Coup: First awarded in 1959, this coup recognizes those Tribesmen who served as Camp Scoutmaster for one full session. Awarded once and only one set is worn on a lanyard. Cylindrical coup in three bands: green, white, and green. Coup of the Long Trail: Originally designed for those who attended the National Jamboree in 1960. At first it was to be worn in lieu of paint on the claws. However, in 1961, the coup we now use was established. The intention is to recognize those Tribesmen who share the spirit of Friendship and Warmth outside of our council. Tribesmen earn this coup by attending an approved event such as a National Jamboree or participating in a Scouting high adventure base such as Philmont. Tribesmen can earn this coup as a Brave and then receive the coup when they advance to Warrior. A Tribesman must meet with a Medicine Man prior to going or he or she will not be eligible for this coup. Awarded once and only one set is worn on a lanyard. Tapered cylindrical coup: clear with green center. Military Service Coup: First awarded in 1946 at a special military retreat to honor all those who had returned from the Armed Forces. Since then, it has been given to all Tribesmen who have fulfilled their military obligations. Awarded once and only one set is worn on a lanyard. Cylindrical form in three bands: red, white, and blue (top). Silver Coup (Chief’s Coup): The Silver Coup is the highest form of recognition given in the Tribe. It was first awarded in 1959, by Chuck Henion (Chief Swift Eagle) to Tribesmen for special merit and outstanding service to Mic-O-Say, their Reservation, and to Scouting. Presented by the Chief, this is a very special one-time award to those Tribesmen who serve unselfishly. Spherical coup made of silver. Recipients of the Silver Coup are listed on the Silver Coup page.